Keep your actor biography brief—about 100 – 250 words. Biographies that are too long simply don’t get read. Write in the third person (“John Smith acted in”, not “I acted in”). Include your acting credits and your training. If you have a long list of credits, just mention a few credits (the most impressive ones) in the narrative part of your bio and then add a point-form list of all credits at the end. Give the name of your role, the production and then the year in brackets. Usually the order is theatre-credits, film-credits, television-credits. If you do commercials state only whether you have been an on-camera and/or voice-over performer and whether you have a commercial reel or tape. Do not list the products. Mention your acting-related awards and achievements. It’s optional to include personal information such as marital status, number of children, and place of birth. If you don’t have many acting credits yet, this personal information can help flesh out your bio. List your contact details at the end. Since a bio doesn’t have room to reflect all your achievements, you can also include a website link to your portfolio and contact email address. You might have a lot of experience but no formal training. Or you might have attended a prestigious acting school but you don’t have much experience yet. Don’t worry about it. You can choose what gets highlighted in your actor bio. Even if you have no acting experience, just write about what you do have (e.g. training, talents, a certain “look”) and don’t even address what you don’t have. In the end, the ability you show at the audition will count most of all. There are plenty of people performing on Broadway who did not attend the “name-brand” schools. Like a fashion designer, you have a brand to sell. You’ve got skills, you’ve trained and studied your craft, you’ve acted, and you do good work. Project this in your theatre bio by describing yourself with confidence and verve. You need more than one theatre or actor bio, depending on its intended purpose. Here are the most typical bios you might need. a short bio or “blurb” that you would use in a theatre program. A short bio is normally no more than two or three sentences. a longer bio would be needed for an audition. This would be 100 – 250 words long. a full biography might be required for your website or a press release. A full length biography could up to a page in length (250 – 500 words). ____________ (your name) has appeared in over _______ (use a general word such as “several” or “many”, or specify the number) film, television, and theatre productions (cross out any that don’t apply). You may have seen him/her in __________, __________, ___________ and _____________(names of productions), to name just a few. ____________’s (your name) ability to ____________ (what you’re good at, or what is unique about you) has been recognized by the ____________ (name of awarding body) with the _________ award. ___________ (your name) studied ____________ at ______________________ (name of school), graduating with a _____________ (leave off last part if you didn’t graduate). A native of ____________ (where you grew up), ____________ (your name) now lives in ______________ (city or state). __________ (your name) can be reached at _______ (your contact information or website). 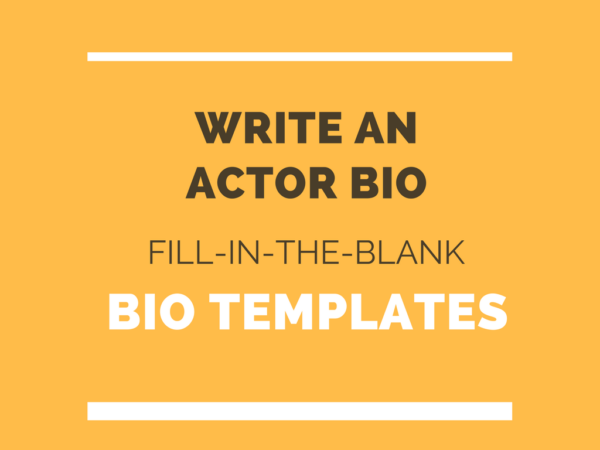 A template makes writing an actor bio quick and easy! Does writing your professional bio seem like just one more task on your long to-do list? If so, get a detailed fill-in-the-blanks bio template written specifically for theatre and acting professionals. You’ll also get a version written specifically for novice actors with no acting experience. You’ll have it all done and complete within the next 20 minutes.